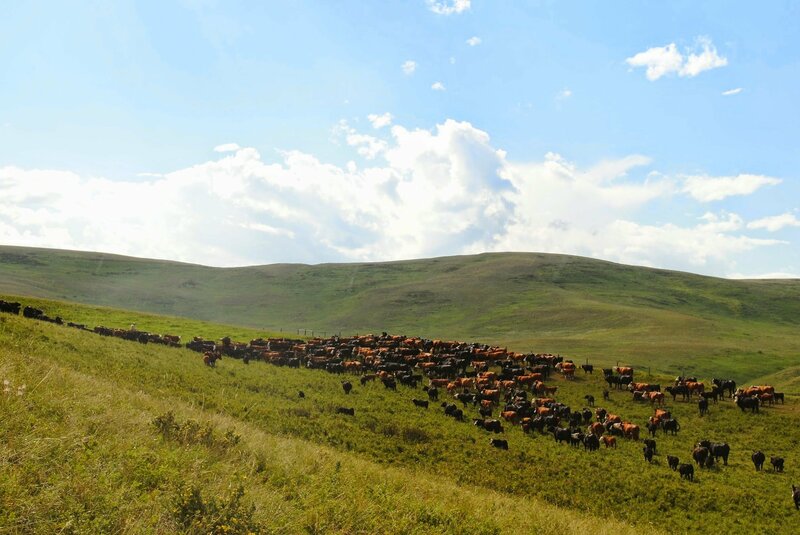 Cattle producers are stewards of 9 million hectares of grassland in Alberta that support biodiversity (Kosinski 2012). However, the relationship between beef production and biodiversity is complex and poorly understood. We do know that cattle grazing can have both positive and negative effects on wildlife; for example, cows in riparian areas can degrade sensitive vegetation and aquatic life. On the other hand, the endangered Burrowing Owl can benefit from beef production because grazed prairie vegetation can improve the owl’s hunting efficiency (COSEWIC 2006). It’s important to understand the relationship between biodiversity and beef production in Alberta, especially considering current efforts to assess the sustainability of beef in Canada (e.g., the Canadian Roundtable for Sustainable Beef; Alberta Beef Producers) and worldwide. Thus, the ABMI is pleased to announce the Biodiversity assessment of Alberta’s beef industry, a new collaborative project involving researchers from the ABMI, the University of Alberta, the Government of Alberta, and Agriculture and Agri-Food Canada. 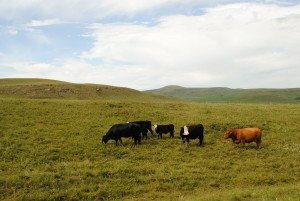 Sponsored by the Alberta Livestock and Meat Agency, this three-year project explores the impacts of beef production on biodiversity in Alberta’s pastures and rangelands. The project uses existing biodiversity data collected as part of the ABMI’s long-term monitoring program, as well as data from Alberta Environment and Parks, and other sources, to explain how biodiversity differs among land cover types, and explore how biodiversity responds to different grazing regimes. For example, low and moderately grazed rangelands that are grazed in the summer months may have a different impact on biodiversity than do rangelands that are grazed at a higher intensity, by more cattle, or for a longer period of time. The project also includes a field study to determine how biodiversity data relates to assessments of rangeland health. These analyses will enable the project team to develop a framework and a rigorous and practical methodology for assessing the positive and negative impacts of beef production, directly supporting existing efforts led by the Canadian Roundtable for Sustainable Beef. The project is well aligned with global trends in the use of life cycle analysis to assess the impacts of livestock production on biodiversity. In fact, assessing the impact of livestock production on the environment, including biodiversity, is the challenge set before the United Nation’s Food and Agriculture Organization (FAO), who in 2012 commissioned the Livestock Environmental Assessment and Performance (LEAP) Partnership, an initiative between the private sector, government and NGOs. An expert panel of 10 international scientists was tasked with developing metrics and methods for assessing and monitoring the impact of the livestock sector on biodiversity, resulting in a better understanding and management of the key factors influencing the sector’s performance. LEAP has now released its “Principles for the assessment of livestock impacts on biodiversity” draft for public review (available here) as well as “A review of indicators and methods to assess biodiversity”. The ABMI’s biodiversity monitoring program was referenced in LEAP’s review, including its Biodiversity Intactness Index as a metric for understanding changes in biodiversity in response to human disturbance. The ABMI is well positioned to assess biodiversity response to beef production, having surveyed over 200 grazed sites in the grassland and parkland natural regions of Alberta. The research produced by both the LEAP partnership and the Biodiversity assessment of Alberta’s beef industry will enable those with a stake in the beef industry to include biodiversity in a comprehensive assessment of its environmental impacts. The Biodiversity assessment of Alberta’s beef industry will also highlight management practices that can benefit biodiversity in beef production systems. Livestock production in Alberta and around the world faces the dual challenge of satisfying an increasing food demand with responsible stewardship of land and other resources. LEAP and the Biodiversity assessment of Alberta’s beef industry project represent crucial steps forward in building the knowledge base that will allow us to meet that challenge. Read about former ABMI employee Dr. Shannon White’s experience with LEAP here! Kosinski, S. 2012. The value of Alberta’s forage industry. Alberta Agriculture and Rural Development. Edmonton, Alberta. 51 pp. Alkemade et al. 2013. “Assessing the impacts of livestock production on biodiversity in rangeland ecosystems.” Proceedings of the National Academy of Sciences 110.52: 20900-20905. Bai et al. 2001. Relationship between plant species diversity and grassland condition. Journal of Range Management 54: 177-183. Capper, J.L. 2011. The environmental impact of beef production in the United States: 1977 compared with 2007. Journal of Animal Science 89: 4249- 4261. COSEWIC 2006. COSEWIC assessment and update status report on the Burrowing Owl Athene cunicularia in Canada. Committee on the Status of Endangered Wildlife in Canada. Ottawa, Ontario. Eshel et al. 2014. Land, irrigation water, greenhouse gas, and reactive nitrogen burdens of meat, eggs, and dairy production in the United States. Proceedings of the National Academy of Sciences 111: 11926-12001. Lusk, J.S. & N. Koper. 2013. Grazing and songbird nest survival in southwestern Saskatchewan. Rangeland Ecology & Management 66:401-409. Milchunas et al. 1988. A generalized model of the effects of grazing by large herbivores on grassland community structure. American Naturalist 132:87- 106. Nixon et al. 2015. Climate change and the provision of ecosystem services in Alberta: an initial assessment of impacts and adaptation strategies on Alberta’s rangelands. ABMI. Edmonton, Alberta.